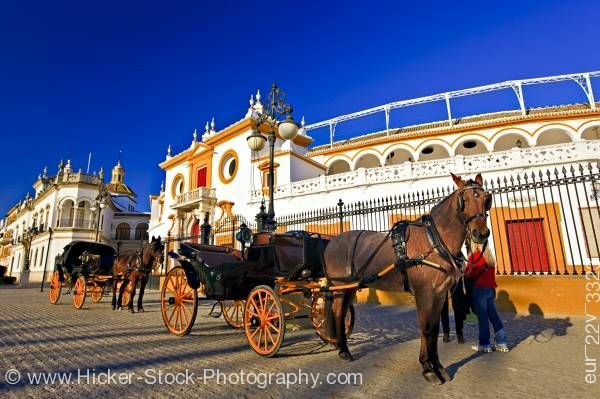 Stock photo of horse drawn open carriages outside the Plaza de Toros de la Maestranza (Bullring) in the El Arenal district, City of Sevilla, Province of Sevilla, Andalusia, Spain, Europe. Chestnut horses are harnessed to the front of their open carriage in front of the Plaza de Toros. This stock photo shows horse drawn carriages outside the Plaza de Toros de la Maestranza (Bullring). Two chestnut horses are harnessed to the front of their open carriage. The carriages are black with large spoke orange wheels. The carriages sit in front of the bullring. It has a tall wrought iron lamp post and fence in front of it. The front of the building has an arched doorway with a second floor above that shows a small porch with a railing. On each side of the porch are two round windows. The building is white with orange trim and red doorways. A railing runs above the first floor with multiple archways in the background. Another detailed two story white building trimmed in gold is in the background. The second story shows several archways with columns. Horse drawn carriages outside the Plaza de Toros de la Maestranza (also La Real Maestranza - Bullring) in the El Arenal district, City of Sevilla (Seville), Province of Sevilla, Andalusia (Andalucia), Spain, Europe.